If you have a small lawn, mowing it yourself will save money and get you out in the fresh air. While self-propelled, rear engine, and tractor mowers are more powerful than you will need for a small lawn, push mowers, electric mowers, and reel mowers are less expensive, easier to use, and require less maintenance. So, to choose the best lawn mower for small yard, it is important to consider your yard type. Our top pick for the best lawn mower for a small yard is the Greenworks 40V Force Cordless Lawnmower. It´s lightweight and comes in a compact design so you can move it around without getting tired. It runs long enough for small yards and provides you with the option to either bag or mulch your clippings and the 5-position height adjustment lets you choose from a wide cutting height range. This cordless Greenworks lawn mower, with a 40V lithium battery is a great mower for small yards because it is so versatile. Its 2-in-1 feature that provides you with the option to either bag or mulch your clippings and its single lever 5-position height adjustment lets you to choose from a cutting height range of 1-1/4 to 3-3/8 inch. These are great features because they allow you to adjust the mower for your specific needs. Another great feature of this lawn mower is its compact size and light weight, which make it easy to push and convenient to store. The handle folds down and locks for transport and storage. As a cordless electric mower, it requires little maintenance and has no cord to get in your way. Many very small lawns can be mowed with one charge, but if your lawn is a bit larger, you might want to invest in a second battery. If you are looking for the best inexpensive lawn mower for small yard, this reel mower made by American Lawn Mower might be just what you need. With 5-inch steel alloy rotary blades that offer 16-inches of cutting width and adjustable cutting heights offers a precision cut. The height of this mower will spare you from bending over and straining your back. The 10-inch wheels, which run smoothly and easily over tall grass, are another great feature. At 25 pounds, the frame is lightweight and easy to push. All of these convenient features and its classic design make it one of the best inexpensive lawn mower for small yard. With the best battery available, a 56-volt lithium ion battery, this EGO mower has a running time of almost one hour on a single charge. Another great feature of this mower is its 20-inch cutting deck, which will help you get the job done quickly while still allowing you to manoeuvre through tight areas. With an engine that starts at the push of a button, this lawn mower is easy and convenient to use. It folds down and is easy to store. Other convenient features include LED headlights, which help you mow in the early morning or late evening and five-deck height adjustment. This Black+Decker 3-in-1 is a cordless electric multipurpose tool that converts from a mower to a trimmer to an edger. This is a great feature if you have a small lawn and limited space, because it will spare you from purchasing and storing 3 separate tools. To convert it from a mower to a trimmer, the mower deck is detachable. The trimmer head rotates for use as an edger. Its motor is powerful enough to get the job done for a small yard. With PowerDrive transmission, this mower can mow and trim its way through your grass and weeds and will work well on both flat and sloping yards. Another good feature is its lightweight and compact size, which makes it easy to push, carry, and store. The detachable mower deck is easily washed out, and the automatic feed spool spares you from the chore of adjusting the spool. Other great features are the adjustable handle and height positions, which will take the strain off your back and help you control the mower regardless of your height and the easy set up. With this best corded lawn mower for small yard, you can mow your grass for very little cost. The only maintenance that is required is sharpening the blade. It bags, mulches, or discharges cuttings and provides seven cutting height options ranging from 1.5 to 4 inches. These features make this a versatile and flexible mower that will adjust to your particular needs. This lawn folds down for storage, and has a convenient carrying handle, which makes it easy to use, carry, and store. The cutting path is 20 inches wide and it comes with a 13-gallon nylon grass collection bag. Running on clean, reliable electric power, it will help you keep your lawn looking great with no hassles, little expense, and no emissions. This company, which started in 1910, offers a 2-year warranty. Cutting height range: 1.6" - 4"
This pre-programmable robotic mower might be one of the best automatic lawn mowers for small garden, because it can navigate narrow passages, has an intuitive keyboard and is full programmed out of the box. This is a good lawn mower for a small yard because it is so easy to set up and use. It has AIA technology (advanced intelligence algorithm) for intricate cuts and narrow passages, is responsive and flexible, and cuts most grass types. This versatile robotic mower is self-sufficient and safe. It stays put and has built in security measures such as a PIN enabled lock to prevent unauthorized use, an anti-theft alarm, and tilt/lift shutdown to avoid injuries. It is a quiet, battery powered, eco-friendly mower with zero emission. The company offers good customer service, support, maintenance and it evenly mows up and down hills. The Landroid uses a shock sensor system to mow around obstacles and automatically returns to base in case of rain and for recharging. The cutting height is from 1.6 to 4 inches and it has 5 cutting positions. With a maximum cutting surface of ¼ acre, it is one of the best lawn mowers for small lawns. This might be the best riding lawn mower for small yard because of its compact size. Although it is more expensive than the other choices on this list, this compact riding lawn mower is less expensive than most riding mowers and suitable for a small yard. It has a 382cc auto choke OHV engine, 30 inches of cutting, and top forward speeds of 4.23 mph. With 6 speed transmission and 5 adjustable settings, it offers the benefits of a standard riding mower with the size of a wide cut walk behind mower. It has an 18-inch turning radius, 13 x 5 inch front wheels, and 16x6.5 inch rear wheels, and manual power take-off for fast easy blade engagement. It is ideal for standard lawns of small and medium size with even terrain. With these features, it might be the best gas lawn mower for small yard. It is easily stored in garage or shed, has a powerful engine and a 1.3-gallon tank with a fuel sight window to check gas levels. The seat raises to mid-back and the steering wheel is a 13-inch soft grip wheel. This best riding mower for small yard comes with a 2-year limited warranty. As houses have been getting larger, the lots they’re built on have gotten smaller. The median yard size is now just about 0.14 acres (about 560 square meters), meaning that the number of homes with small lawns is growing. If that is your case, to keep your small yard looking great without the hassle of an expensive bulky machine, you will need a compact lawn mower for a small yard. It´s an essential power tool for any home with yard together with electric hedge trimmers. You should pick one that cuts well, is easy to maneuver, and is compact and easy to assemble and disassemble, durable, and made from high quality materials. Look for models that offer dual-blade cutting systems, which are better at mulching clippings and wider cutting decks, which will help you spend less time mowing. If you are looking for cordless electric models, be sure to consider run time and maintenance requirements. The run time should be about 45 minutes to avoid the need of two batteries. If you are looking at corded models, consider how long the cord is and if it will easily get tangled or caught. Consider the maximum and minimum cutting heights, as well as the weight, the ease of adjustment, the amount of effort it takes to push it, and the width of the cutting swath. Be sure that the cutting height is adjustable and versatile and that it is easy to adjust. Some mowers have a trimmer and edger in one model, which is a convenient feature. If you want a more powerful mower that will work on tall grass and tough weeds or if your yard is a bit larger and more sloped, you might want to consider looking at the best riding lawn mower for small yard or the best self-propelled push mower. It is also important to look for features that make the mower easy to use, such as a washout port to clear out clippings, an electric start system, the ability to fold it for storage, and high-quality wheels that will glide easily over your lawn. Compact mowers are convenient and easy to use in a small yard. Whether to choose a reel mower or a power mower will depend on your personal needs and preferences. A reel mower will produce no fuel emissions or noise and is the best for the environment, but it will require more physical exertion on your part. A power mower can run on gas or electricity. In looking for the best gas lawn mower for small yard, you will need to decide whether you want a gas mower you push yourself, a self-propelled lawn mower, or the best riding mower for small yard. The problem with gas lawn mowers is the toxic fumes that may harm the environment. In looking for the best electric mower for small yard, you can choose between a corded or cordless model. 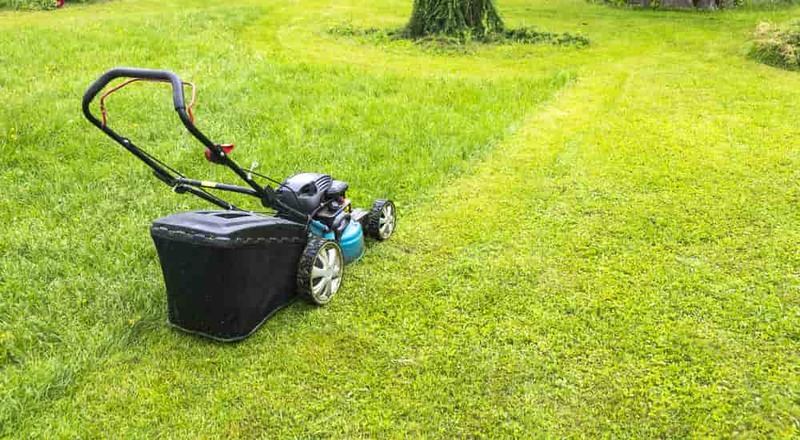 A good lawn mower for small yard should be affordable and reliable, but which one you pick depends on your personal preference and your budget. Do you see mowing the lawn as a therapeutic workout or as a chore? Your landscaping needs should also be considered. The benefits of lawn mowers for small yards are that they will save you time and money, get you out in the fresh air, and are lightweight, efficient, and easy to store. Reel lawn mowers have some advantages for small yards. They will start every time, they are quiet and fuel free, they don’t pollute, they help you get some exercise, and they leave trimmings in your yard, which may help to prevent the growth of weeds. On the other hand, cordless electric mowers, powered by lithium-ion batteries, can run for 20 to 40 minutes, which is long enough for many small yards. When using an electric mower, you will have the satisfaction of a great looking yard without the toxic fumes or the feeling of harming the environment. With approximately 6400 lawn mower-related injuries reported each year, safety is another important factor to consider when choosing a lawn mower. Some safety features to look for in a mower are a handle lever, a blade-brake, and a rubber back flap to protect you from flying debris. Q: What's the best way to use a reel lawn mower? How does it work? A: Reel mowers work by snipping grass like a scissors. In order to use a reel mower, you will need to sharpen the blades, grease and oil the parts, and use it frequently so that your grass does not become too thick. If your grass is thick, you might need to start with a push mower before using a reel mower. Before using a reel mower, be sure to check your yard for obstacles and rocks that might damage the blades. Most reel mowers have five blades which work fine for cutting common grasses. Thicker grasses are best cut with a seven-blade mower. Most will trim to an inch and produce small clippings that can serve as mulch. Keep in mind that it takes more power to use a reel mower, and you might need to overlap mowing rows for an even cut. Q: How long does it take to cut an acre of grass with a lawn mower? The factor 108.9 includes the acres per hour dimensions and a 10 percent time factor for turning at the end of swaths. The mowing speed is the miles per hour rating at the recommended mowing gear or the usual ground speed (use 9/10 of the mower deck width to factor in overlapping swaths for a uniform mowing job). Q: What size is a lawn mower battery? A: There are various sizes of a lawn mower battery, 6 V; 12 V; 36 V and 40 V. The most commonly used is the 6V and 12V battery. The 6V battery is smaller rectangular with an approximate area of 4 by 6 inches. The 12V batteries are bigger and larger rectangular with an approximate area of 8 by 10 inches. Q: How long should a lawn mower battery last? Q: Can you use a cordless electric lawn mower in the rain? A: Using a cordless electric mower in the rain can be unsafe to use because it’s a power tool. It is usually stated in the users’ manual of all electric lawn mowers never to use the mowers when the grass is wet, damp or when it’s raining. Using an electric lawn mower in the rain can be of great danger to the device and the user. A: Especially after summer, it's time to deal with leaves. You can skip raking by mowing over leaves and chopping them into pieces. However, when they begin to pile up you should remove them before mowing by using a battery-powered leaf blower rather than raking them. This will save you too much time. Q: What time should I cut the grass? A: The best time to cut the grass is in the mid-morning (8 - 10 AM). At this time of the day, the dew and daily watering would have dried off. The grass will be dry, at full length and will be perfect for a good cut. If by any means you were not able to cut the grass in the mid-morning, late afternoon (4 - 6 PM) is also a suitable time to cut the grass. At this time, the temperature would have dropped a bit. Q: How many times a month should you cut your grass? A: Cutting your grass once or twice a week is advisable during summer, depending on the amount of rainfall. The more the rain, the more the rate of grass growth and this may result in you cutting it more often. But if a very hot dry summer is observed, then the rate at which you cut the grass can be reduced as the absence of rain will stop plant growth. During hot seasons, longer grass gives shade to the soil and prevents excessive rays on sunlight, preventing soil transpiration which gives the grass supplementary water to live on. Our top pick for the best lawn mower for a small yard is the Greenworks 40V Force Cordless Lawnmower. It´s lightweight and comes in a compact design so you can move it around without getting tired. It runs long enough for small yards and provides you with the option to either bag or mulch your clippings and the 5-position height adjustment lets you choose from a wide cutting height range. However, if you want the best inexpensive and lightweight mower for a small yard, the American Lawn Mower 1204 will be the best choice. It is easy to maintain, quiet and safe to use, and it will give you some exercise while keeping your yard healthy and looking great all summer long. Best of all, you won't have to worry about batteries, cords, or fuel. While reel mowers have the advantage of using no fuel, batteries, or cords, they do require more effort to use. If your yard is too large or your grass too thick, you might want to consider one of the other options on this list.